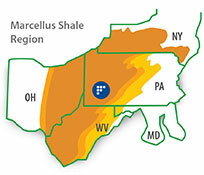 The Marcellus Shale with its untapped natural gas reserves is an unprecedented opportunity for the oil and gas industry. Right in the center of this region is Frontier Steel, the single-source steel service center that distributes and processes carbon steel plate used in Marcellus Shale drilling applications. Whether you manufacture surface production and process equipment, flow equipment, downhole technologies, valve solutions, or intervention products, Frontier Steel can meet all of your processing needs quickly and cost-effectively. We’re able to perform weld prep bevels, stitch cuts, and drill tapping with superior precision on more than 12,000 tons of carbon plated and rolled product that we stock at our 125,000-sq.-ft. storage and processing facility near Pittsburgh. In 2013, we made $1.5 million in equipment and capability upgrades, which include the addition of a second Kinetic K5000 Heavy-duty Combination Plasma/Oxy Fuel Cutting and Machining Center. See Kinetic K5000 in Action. Frontier Steel has added another Kinetic K5000 Heavy-duty Combination Plasma/Oxy Fuel Cutting & Machining Center to its shop floor. 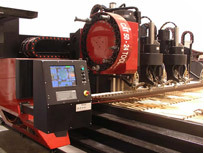 Its 151” x 600” workspace allows oxy-burns and hi-def plasma cuts on wider pieces of carbon grades with fewer welds.